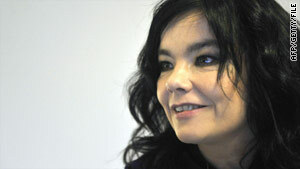 Atheist Ireland has published "blasphemous" quotations from Bjork, pictured, Mark Twain and Salman Rushdie. (CNN) -- An Irish atheist group has published a series of quotations on religion in an attempt to challenge a blasphemy law that went into effect on New Year's Day. The 25 "blasphemous" quotations include the words of Jesus, Mohammed, Mark Twain, Salman Rushdie and Bjork. Atheist Ireland published the list on its Web site Friday. It says it aims to challenge the law, which makes blasphemy a crime punishable by a €25,000-($35,800) fine. "Despite these quotes being abusive and insulting in relation to matters held sacred by various religions, we unreservedly support the right of these people to have published or uttered them," the group said on the site. "We unreservedly support the right of any Irish citizen to make comparable statements about matters held sacred by any religion without fear of being criminalized, and without having to prove to a court that a reasonable person would find any particular value in the statement." Lawmakers in staunchly Catholic Ireland passed the law in July, but it came into force January 1. A person breaks the law by saying or publishing anything "grossly abusive or insulting in relation to matters held sacred by any religion, thereby causing outrage among a substantial number of the adherents of that religion." Those found guilty of breaking the blasphemy law may try to defend themselves by proving that a reasonable person would find literary, artistic, political, scientific or academic value in what they said or published, the law says. Atheist Ireland called the law "silly and dangerous," because it provides an incentive for religious outrage. "We believe in the golden rule: that we have a right to be treated justly, and that we have a responsibility to treat other people justly," the group said. "Blasphemy laws are unjust: They silence people in order to protect ideas. In a civilized society, people have a right to to express and to hear ideas about religion even if other people find those ideas to be outrageous." The group urged the Irish government to repeal the law. It also asked lawmakers for a referendum on removing all references to God from the Irish constitution.